Did you know that your oral health is linked to your overall wellness? Oral health is not only important to your appearance and sense of well-being, but also to your overall health. In some cases, oral problems can be a symptom of other diseases. 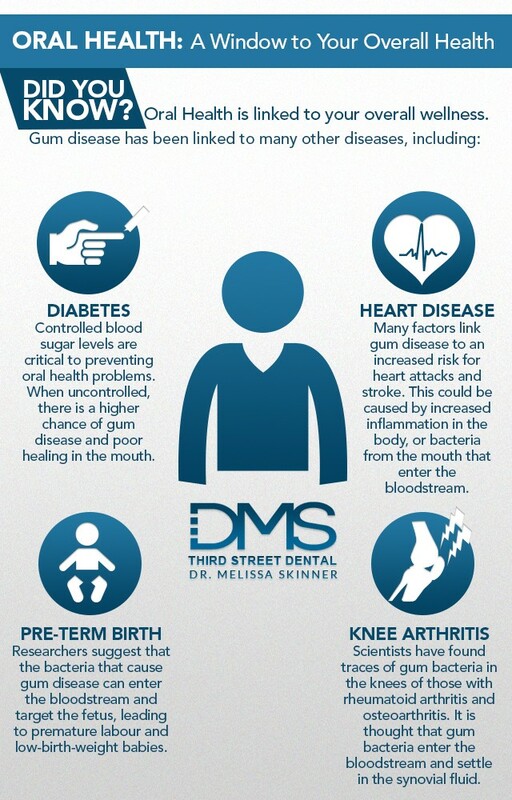 Diabetes increases ones risk to gum disease and dry mouth. Controlled blood sugar levels are critical to preventing oral health problems. When the blood sugar levels are not controlled, there is a higher chance of gum disease and poor healing in the mouth. This is because uncontrolled diabetes impairs white blood cells, which are the body’s main defence mechanism against bacterial infections in the mouth. Many studies have linked gum disease with an increased risk for heart attacks and stroke. The reason for the link is not clear. However, some researchers suggest that gum disease increases inflammation in the body, which is a risk factor for heart disease. Others suspect that bacteria from the mouth can enter the bloodstream, contributing to plaque buildup in arteries. Endocarditis, a condition that involves inflammation of the lining of the heart valve, is most commonly caused by bacteria (including oral bacteria) that enter the bloodstream and travel to the heart. Studies have linked gum disease in pregnant women with increased risk of preterm birth and low-birth-weight infants. Researchers suggest that the bacteria that cause gum disease can enter the bloodstream and target the fetus, leading to premature labour and low-birth-weight babies. One possible mechanism begins with the effects of the endotoxins released from the bacteria responsible for periodontal disease. Oral bacteria may contribute to some cases of knee osteoarthritis and rheumatoid arthritis. Scientists have found traces of gum bacteria in the knees of those with rheumatoid arthritis and osteoarthritis. It is thought that gum bacteria enter the bloodstream and settle in the synovial fluid. These are just some examples of how our oral health is linked to our overall health and showcases why it is so important to make good oral health a top priority. This means regular brushing and flossing at home, and booking regular cleanings and check-ups with your dentist. Our Third Street Dental North Vancouver office is located in the lower Lonsdale area. We are a family dental office, currently accepting new patients. Thank you for voting us Favourite Dental Clinic in the 2018 Readers Choice! Copyright © 2012-2019 Third Street Dental. All Rights Reserved.